Having garnered only half the number of votes of TV comedian Volodymyr Zelenskiy in the ballot’s first round last month, Poroshenko has recently stepped up attacks on his opponent over the economy, ties to the Kremlin and his relationship with an exiled billionaire who once owned the country’s biggest bank. 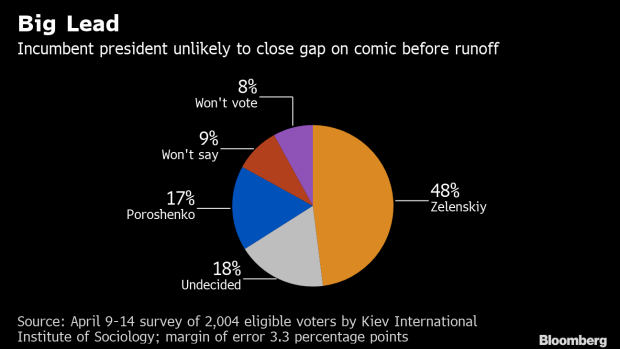 But the latest poll, released, Tuesday, signals Zelenskiy is set to score a resounding victory, with 48 percent of voters ready to back him. The survey suggests Poroshenko’s latest remarks -- from an increasing barrage of interviews, talk-show appearances and televised meetings with businessmen and voters -- have been largely ignored. They include claims that Zelenskiy’s views are pro-Kremlin, that his idea to hold referendums on NATO and European Union membership will harm hopes of Western integration, and that his business links to tycoon Igor Kolomoisky could mean the nationalization of Privatbank is reversed, causing economic chaos and weakening the hryvnia. He also stepped up anti-corruption efforts that had become bogged down during his time in office, pledged to stop appointing business associates to official positions and said younger people -- a key demographic for Zelenskiy -- would feature more in his administration. It appears the push won’t be enough to swing the contest, even with Zelenskiy remaining largely silent. But Poroshenko has one last chance to sway opinion as the pair debate each other for an hour on Friday evening, two days before the runoff. --With assistance from Kateryna Choursina.